Men's mittens with allover stranded design. A man I know mentioned that he would love to own some knit wool mittens. I decided to knit him a pair. Both mittens are worked the same and can be worn on either hand. You will have extra yarn and can make a third mitten as a spare, in case one gets lost. 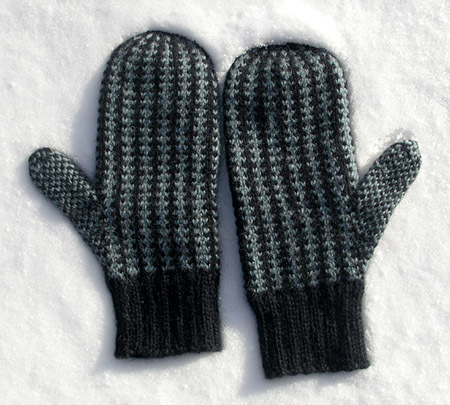 These mittens are knit tightly to keep the cold Wisconsin winter winds off your hands! 9.3 " around hand at palm, above thumb gusset. Note: Chambray Heather is no longer in production. It is a grey with a slight greenish cast. Color #107 Sage would substitute well. Other options include Plymouth Galway #728 (New Sage), or #738 (Ocean). 24 stitches/28 rows= 4 inches in stranded colorwork pattern. Using MC, CO 48 sts. Distribute sts between needles, place marker and join to begin working in the round, being careful not to twist. Round 1: [K2, p1] around. This round sets rib for cuff. Work in rib as set until work measures 2.5 inches. Next Round: [K12, m1] 4 times, k0. 52 sts. Join CC and begin working Chart A.
Set-up Round: K3 in patt, place marker, m1, k1, m1,place marker, k to end of round in patt. Next Round: K all sts in patt. Work sts between markers foll Chart B, incorporate new sts into patt. Next Round: K3 in patt, slip marker, m1, work to next marker, m1, slip marker, k to end of round in patt. Repeat these 2 rounds 5 times more. There will be 15 sts between markers. Next Round: K3 in patt, place gusset sts on st holder, CO 5 sts over gap, k to end of round in patt. Cont in patt as set, incorporating new sts into patt, until work measures 10.5 inches from beginning, or desired length. Mitten should reach top of wearer's ring finger. Note: While working decreases to shape top of mitten, it will not be possible to maintain color pattern exactly. Try to maintain the vertical bands of color as much as possible. Next Round: [K2, k2tog] around. 42 sts rem. Next Round: [K1, k2tog] around. 28 sts rem. Next Round: K2tog around. 14 sts rem. Break CC. Next Round: Using MC only, k2tog 7 times, k0. 7 sts rem. Draw yarn through rem sts and pull tight. Place held sts from thumb on needles. Using MC, pick up and K 7 sts from CO above thumb gap, and from spaces between CO and held sts. 22 sts on needles. Work foll Chart B until work measures 2.25 inches, or to top of wearer's thumb. Next Round: [K1, k2tog] 7 times, k1. 15 sts rem. Work 1 round even. Break CC. Next Round: Using MC only, k2tog 7 times, k1. 8 sts rem. Turn mitten inside out and weave in ends. Turn right side out and enjoy! Elizabeth Morrison has been playing with textiles since she was very young. She got serious about knitting in the late '80s and has been hoarding yarn ever since. Elizabeth lives in Madison, WI with her husband, two sons, two cats, and miscellaneous other critters. She has given up housework in order to make more time for knitting.